Like many of you, I have assembled everything from dining room tables to bunk beds with an Allen wrench and a beverage-stained set of black-and-white line drawings. I’ve even drilled new holes, convinced that the instructions had to be wrong, only to find out I had the board upside down—or inside out—or otherwise got caught up in some sort of “Tab A into Slot B” kerfuffle. I was out at the U.S. Department of Energy Solar Decathlon this weekend looking over video of students describing the amazing energy-efficient houses they’ve designed and constructed for the 2011 competition here in Washington, D.C. 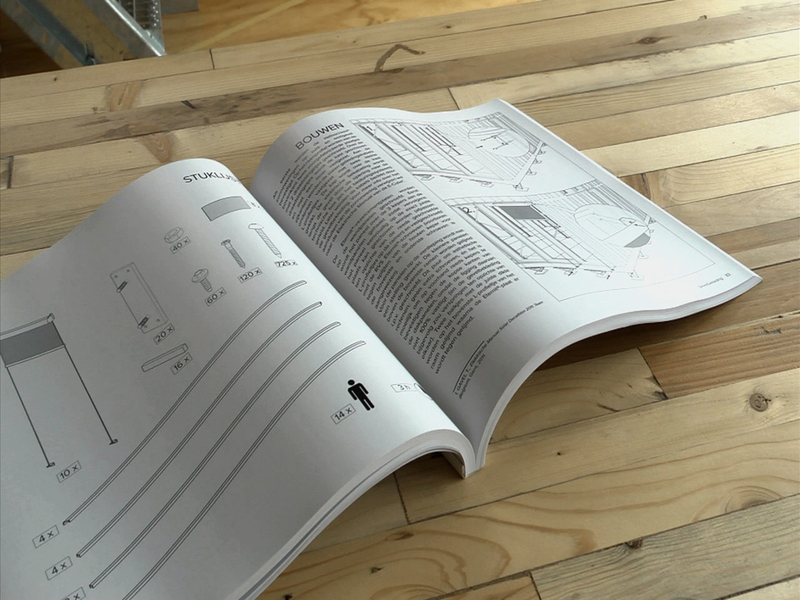 While reviewing a story about Team Belgium’s house, E-Cube, the video editor paused to point out the instruction manual for the house. This was not the manual to operate the house; it was instructions to build the house. Assembly instructions for the external window shades on “E-Cube,” Team Belgium’s entry to the U.S. Department of Energy Solar Decathlon 2011. You’ve seen them before. There is a picture of one type of screw, followed by an “x” for “times” and then the quantity of screws that was supposed to have made it from the factory, to the warehouse, to your car, to the spot on your floor where you’ve decided to spend your Saturday afternoon with eight slices of pepperoni pizza and the latest episode of “my house is cooler than yours.” Here’s the nutty thing: On the monitor, we saw the parts list for one of the steps to build E-Cube. It read something like: short screws x 60, long screws x 120, and then, at the bottom, a figure of a person … x 14. We had a good laugh. That is one complete manual! It even tells you that you need 14 people to install the window shades—for three hours! 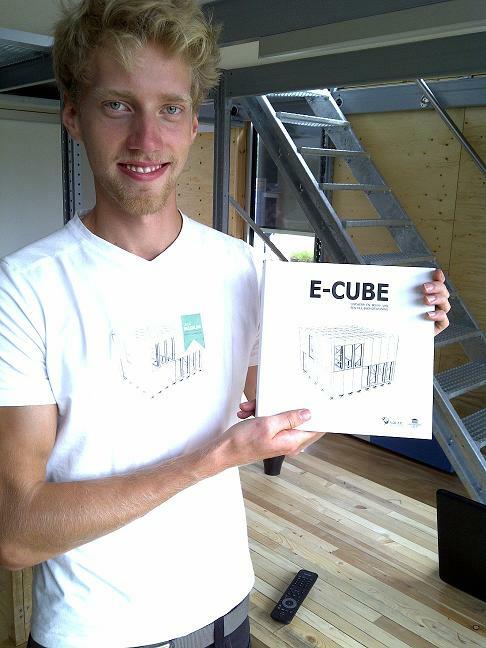 Pieter Jan De Loof, a student at Ghent University, displays the assembly instructions for E-Cube, Team Belgium’s entry to the U.S. Department of Energy Solar Decathlon 2011. It turns out those window shades—covering each of E-Cube’s windows—are actually computer-controlled and fit on the outside of the house. Pieter told me many people think those are a mistake, but he’s quick to point out that when trying to keep a house cool, it’s best to keep direct light from ever entering the house. Exterior shades, as opposed to interior shades, do just that. And build it they did—in four days with 25 people. Now, E-Cube is being monitored and judged in 10 contests—along with 18 other student-designed houses—to see just how energy-efficient, livable, and affordable it is. So if you are in the market for a highly efficient solar-powered home and you are a real do-it-yourselfer, invite 24 of your closest friends over for four days and build yourself an E-Cube. Check out this video about E-Cube. Phil West is the director of Communications for the Department of Energy’s Office of Energy Efficiency and Renewable Energy. This entry was posted on Tuesday, September 27th, 2011 at 12:32 pm and is filed under Solar Decathlon, Solar Decathlon 2011, Team Belgium, Teams.